Pikes are held by the regiment - you won't have to worry about storing and transporting a sixteen-foot weapon unless you become a designated pike-carrier. Other equipment can be borrowed from the regiment for the first few musters. 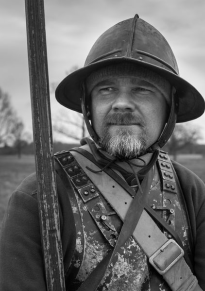 The pikeman is armed with a 16-foot long ash pole known as a pike and may also carry a basic sword called a tuck for close quarter combat (although in the 17th century these would more than likely be used for chopping wood and pikemen rarely carry their swords in Sealed Knot battles). 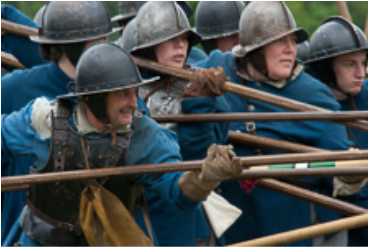 The pike is most effective when used to keep the cavalry at bay whilst the musketeers reload, although at Sealed Knot battles they often clash in a ferocious "push of pike" with their opponents. The pikemen generally wear armour comprising of back and breast plates, although few wear the full armour consisting of a gorget to protect the throat and tassets designed to protect their thighs. Some prefer not to wear armour at all, although every pikeman wears a helmet to protect their head.